It is currently strawberry season here in NC, and this is a great way to use up all of those freshly picked berries. But, feel free to experiment with substitutions based on your family’s favorites. I noted some alternatives that we have tried below. Please leave a comment if you try something new to let us know how it turns out! I’ve never thought about adding the spinach! I’ll try it. Thanks Lisa! Hi Lisa! My name is Hope and I found you just searching on the web. I recently finished reading “In defense of food”. I am a going to school for dietetics because i love food and nutrition and all of that. I just made a goal for myself to cut out all processed foods! I started a blog about it also, however I am going to switch over to wordpress because I like it more than blogger. anyways, just wanted to say HI and say I am excited about what you are doing. I just started with this whole goal only about a week ago, so i’m a little new on it all, but I am super excited! Hello there! I love coming across others who are on board with this. I was considering blogspot too, but several people recommended wordpress to me and it has worked well so far. Also, I felt very overwhelmed in the first few weeks of changing our diet so hopefully some of the stuff I have written about will help you out. I agree that the book was great, but once you decide to move forward it doesn’t exactly tell you what specific foods to buy and what recipes to make (which is what I am trying to do here). I would love to trade notes once you get you your new blog going! My girls and I loved it! Thank you! I’ve never tried it…start with a little bit at first to make sure it works okay! I know this is late, but for others that might read this, frozen spinach has a much more spinach-y taste than fresh, raw spinach. I thought the frozen was a great idea for smoothies, but it was awful! And by awful, I mean inedible! It could have been a brand issue. I think mine was 365. When using spinach, I read you should blend it first with your liquid to make sure it’s blended well, and then add the remaining ingredients and give another whirl. I use one banana and frozen blueberries, greek yogurt, nuts, oatmeal, soy milk with the spinach and one would never know the spinach was included. My family and I have “green smoothies” (all fruit/greens with water) every morning – I hate salads, so this is how I get my greens down! Two tips: blend your spinach and liquid FIRST, then add the other fruit. That way the spinach is microscopic and you don’t get any icky chunks. Second, you can buy spinach at Costco, or any other fresh bulk way, and then wash it and freeze it in gallon bags! Easy to break off a chunk for smoothies and cheaper than store-frozen! Fantastic tip!! And it is so much faster to wash it once and freeze it than to wash a handful every time you want it. Thanks! My family has smoothies every morning that are similar to these. However we substitute frozen mango and water in place of yogurt and milk as we are trying to eat primarily vegan. If you’ve never read ‘The China Study’ by T. Colin Campbell, I would highly recommend it. I am just starting a clean eating blog and getting recipes from my clean eating magazine. I notice when the recipes call for yogurt it is always greek yogurt. Do you ever use greek yogurt? I couldn’t find Greek yogurt that was both organic and whole milk so I just use regular b/c I want it to be both of those things. Greek yogurt is a little higher in protein, but other than that I think they are equally good. I have at times made my own yogurt – and to make Greek yogurt, you just take regular yogurt and drain it. Put it in a clean dishtowel, wrap a rubber band around the top to hold all the sides of the towel together, and hang someplace with a bowl underneath for a bit. Leave it for an hour or so and you’ll get Greek yogurt, leave it longer and you’ll get an approximation of cream cheese – which I have used plain on bagels, etc. or flavored with herbs and such to make different spreadable cheeses. HTH. I started making sneaky healthy smoothies for our son a few months ago when he went through his last round of teeth (8 teeth in 6 weeks! )and was super hungry but didn’t want to chew anything. We make them often now as a snack before a big outing or if dinner gets rejected. I make his smoothies with silken tofu instead of banana and yogurt. I add half an avocado plus 2 tbl. of ground flax. I also add some steamed and cooled butternut squash and carrots plus spinach. Then we do either peaches or mango with raspberries and strawberries. To thin it out I add some unsweetened soy milk and a splash of orange juice. @Morgen – I don’t want to tell you what to do, but I wanted to pass on some information about the dangers of soy products, especially for male children. The scientific study information is available at Weston A. Price Foundation. I’m giving the Week 1 Pledge a whirl and am looking to add this to my breakfast meal (which I currently don’t eat). I’m wondering how many ounces this smoothie recipe makes. I would only be making it for me and I don’t want a ton of leftovers cause I’m not sure if it would keep for me. If you are making the recipe just for you I would cut the recipe in half…good luck! I don’t know if someone else already suggested this but we add kale (and spinach- 1 cup of each) to our smoothies and you would never know (except for the fact that the smoothie is green in color)! My kids LOVE them which is awesome since those two greens are so great. Made these for breakfast for my kiddos…funny story my picky eater son who is 7 years old. I told him that if he had the entire smoothy he is going to do AWESOME at his basketball game. We went to his game nd he had one of his best games. :) Now he is requesting that I make it before his next game. LOVE IT!!!!! YOU ROCK…what I love about your recipes are the fact that hey are really kid friendly. We had your whole wheat waffles this morning and they were ALL gone ( none to freeze ). I make smoothies for myself a few times a week, and I always add oatmeal to make them more filling (just 1/2 cup of quick-cook oats straight from the pantry). For my first experiment in hiding healthy stuff, I tried spinach and couldn’t even tell it was in there — I buy frozen bagged spinach (Trader Joe’s has a cheap organic version) because it’s easier to shake out what I want instead of hacking at a frozen block of spinach. For my next experiment I tried frozen peas, but never managed to blend them finely enough. They’re pesky. Now I’m using frozen broccoli and it’s great! It blends nicely and I can’t even tell it’s in there. Mine were a little tart. I didn’t use bananas but used the honey. Maybe the strawberries were tart. Any ideas?? I think ripe bananas sweeten it up quite a bit…might need more honey if you aren’t going to use them. our favorite smoothie is a kale colada…handful of kale (I keep some frozen)~ a banana~ some pineapple juice (or fresh pineapple)~ and a small can of coconut milk (the real stuff found in the Asian section, not the coconut replacement milk)~~ YUMM!! I love to add a little raw beet to all our smoothies cause it gives the illusion of a sweeter berry taste with more nutrition. When ever I make anybody a smoothie (kid or adult) with a little beet added (spinach, kale, beet greens, banana, flax seed, cucumber, bell pepper, almonds etc, etc) they always think they are tasting some sort of berry, even if there is none in there. Awesome! I love my Vitamix! Another thing you could use instead of honey is an all natural sweetener such as Agave! Also, another alternative to spinach is Kale! My kids have been drinking these smoothies for months now and have no idea how good and healthy they are for them!!!! Is there an alternative to yogurt? For some reason I can’t ever get yogurt to last longer than a day or two in my fridge so we don’t buy it very often. You could try it with extra milk instead of yogurt. smoothies or juices in order to get down more vegetables a day. Is it possible to make these with only a regular blender (not something like that expensive veggiemaster? What is the difference between one that is called a smoothie or a juice? Thanks. To get advice on juicing definitely check out http://foodbabe.com/ …she is the juicing/blender expert! I’ve been unemployed for a year now and really wanted a blender to make smoothies, got mine for 24.99 at Aldis!!! It crushes ice just like it said it would do and has a 3 year warranty! So yes they will! Is this what you put in the cute little pop molds for their lunches? I just made the coconut milk smoothie recipe with kale, spinach, coconut flakes, a banana, pineapple, frozen mango and of course organic canned coconut milk…YUM! I ALWAYS put carrots in smoothies – I’m surprised it’s not mentioned more here… I thought that was such a common thing! Carrots don’t change the taste at all – they hide sooo well in smoothies. Thanks for sharing! I just got a Vitamix, so I’m a bit smoothie happy. :) I LOVE all of the FRESH, whole foods I can make meals and snacks with. Awesomeness! I tried adding carrots. It tasted ok but the need to chew bits of carrots was a little unpleasant for the kids. Is there a trick or do I just need a better blender? I love these yummy smoothies! :-D They were very good. We added some extra strawberries for flavor, too. Also, try GREEK yogurt, especially Fage brand at Aldi. It made ours creamy and delicious. I am on day four of making smoothies, and just love the blender I bought at Aldis for 24.99! It crushes ice and apple chunks in seconds. I use fresh baby spinach , Chia seeds…google those, they are so good for you and fill you up, full of omega 3s, I also use flaxseed, or hemp seeds, fresh pineapple, apples, bananas, strawberries. I am going to try sneaking in some cucumber, celery and carrots to the above and see how it goes! I have been making smoothies for a while and have learned that fresh spinach, zucchini, or squash can be added without altering the taste. I don’t like the consistency of smoothies when using yogurt, any ideas of a substitute?! I use OJ, or coconut milk, or coconut sparkling water. You can also add 100% fruit juice. I don’t like my smoothies too thick. I avoid soy, broccoli, kale and spinach due to a thyroid disorder (they have natural thyroid blockers in them) – is there an alternative to these ingredients that would still offer nutritional value in the smoothies? We have smoothies everyday in our home. I become very adventurous with mine and the kids generally will follow suit. We generally use a peanut butter or almond butter, banana base and to it we add variations: always a green (kale, swiss chard or spinach), flax seed, chia seed, a milk substitute (hemp, almond, coconut or our new fave Almond coconut blend) and yogurt or kefir. If we want a chocolaty smoothie we had raw cacoa powder – kids slurp these up and have the most healthiest of breakfasts! Could you add measurements of how much of each ingredient you put in? Love the chocolate – almond butter idea. How many servings does this recipe make? I’ve been making it for a while and my kids and I absolutely love it, but am wondering if we’re drinking enough of it or too much. Thanks! I wouldn’t use spinach with milk the calcium doesn’t allow the iron to be absorbed by the body. We use organic juice instead. I got some chard in our organic co-op today and am trying to figure out what to to with….besides smoothies any ideas?! 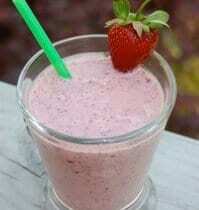 I was wondering how your smoothie in the picture is nice and pink? When I add the spinach, it turns a murky brown color :) Still tastes good, but my kids shy away from it due to the color. Hi! Can I freeze fresh spinach to use in smoothies? I bought a large tub and I don’t want it to go bad before we use it all. Thanks! Just tried this smoothie as a Popsicle. I think I put to much spinach because it came out green. I thought my kids would not want to try because of the color. My three year old twins ate two Popsicle ( the ones you give your daughter for school lunch) and my five year old ate one. For never eating it before it will be our special ice cream from now on. Thank you! I want to try and make smoothies to put in the Norpro silicone ice pops. My kids love yogurt and love berries but they hate the seeds, do you have any suggestions on how to make them seedless? Made this for me and the kiddos today. I used organic frozen broccoli because that is what we had on hand. Turned out great! Is there a nutritional or taste difference if I use frozen kale/spinach instead of fresh? I actually started making smoothies a few weeks ago when i had one from Panera. It was free, and when I saw how easy it was I was surprised. Granted, I did pay $4 for one later when I was pressed for time, but after that, no way! I’ll make my own! We picked and cleaned over 50 lbs of strawberries from a local u=pick place for making jam and SMOOTHIES! I keep meaning to add chia seed, but haven’t most of the time. I usually use strawberry, but have done blueberry or peach. I’ve started making my own yogurt as well. I think the kid’s favorite, though, was the time I tossed a handful of chocolate chip in with the strawberries and made a chocolate-covered strawberry smoothie. And I keep a pack of those little 3oz plastic cups (like they use in bathroom dispensers) and if (when!) I have a little extra after filling everyone’s cups, I pour it into one or more of those and put them in the freezer. The kids love them as a cool-down treat after playing outside. What brand of organic yogurt do you use>>?? Do you think we could substitute peaches for the berries? We have tons right now! Made this today…is the recipe above for 1 serving? It seems like A LOT! Loved this recipe!! We used Kale instead of the Spinach and my super picky daughter just drank a huge glass!! Thanks so much for all of the great recipes and lunch inspirations!! I just found your website today thanks to friends who knew I needed lunch suggestions. Thanks so much. I just wanted to share a smoothie recipe we make a lot that my daughter (4) loves. It’s equal parts frozen organic blueberries, frozen organic mango chunks (I get both at Trader Joes’), and plain, whole-milk yogurt (Greek or European style). Then I put in a bunch of kale (I get the organic, washed, chopped mix at Trader Joe’s). I add a little milk depending on how thawed the fruit is or how thick the yogurt is. Then add a good squeeze of lime and some honey. It’s delicious, and it’s definitely the only way I get my daughter to eat kale! HI! HAPPY SUNDAY!! =) Has anyone tried using Vanilla flavored yogurt instead of plain? Just wondering if would taste gross. Thank you SO much for this recipe and the idea to put it in the silicone ice pop makers to send for lunches! I 1/2 the recipe since I only have 1 kiddo and that filled up 4 of the ice pop containers plus left a tad leftover. I tried a little and would never believe there was spinach in it if I hadn’t put it in myself! Amazing! I used raspberries and blueberries for the berries and it’s great. I know my 12 year old is going to love having something new for lunch this week. You’re awesome and thank you so much for sharing your healthy finds! A very excited mom! I love your site and have found so many recipes to be helpful in making a healthy lifestyle change. I am wondering if you have done any research and or have any recommendations on whey protein? We make all sorts of smoothies and add whey protein but I read so many different reviews on this that it has me ultimately more confused than when I first started… Thank you!! fyi – the week 1 menu plan includes this smoothie but doesn’t have spinach on the shopping list. This recipe is even better if you peel and freeze the bananas ahead of time. We’ve been doing that for years. We also make chocolate “milkshakes” by adding a little powdered cocoa (unsweetened) instead of berries. My husband and son also add a raw egg (from our friend–free-range, organic) but I just can’t get beyond the yuck factor and the fear of salmonella. :-/ Somehow my son has made it to 11 years old with no salmonella, though! Have you ever used straight yogurt? Taking it from the yogurt container, into the freezer pops? In the past I’ve used berry yogurt, peaches, bananas and ice. Sometimes a couple of strawberries too. Wonderful! I put in the honey, but I don’t know that it needs it. I think it is great either way! The second time we made this, we used mango instead of berries and added a tsp of vanilla – delicious!! We’ve been making fruit/yogurt smoothies for a couple of weeks and today I made the leap to fruit plus spinach smoothie. The kids (ages 4 and 6) loved them! And they knew the spinach was in there. Even better, my six year old then asked to try fresh raw spinach and she loved it! Amazing. I’m in shock. Thank you!! My daughter is allergic to milk. Any suggestions on how I could still make this for her. Would almond milk or coconut milk be better? And what should I replace yogurt with?? Thanks so much if you can help!! I absolutely love this website!! What blender do you use? Mine always leaves small bits of spinach. I would love to get the Vitamix but it’s a little to much money. How many servings does this recipe make? I can’t wait to try it out! We tried the smoothie recipe this weekend and it was great. I did a double batch to freeze some and have some in the fridge for leftovers. We tried the ones in the fridge this morning (2 days later) and they tasted gross. I have a Ninja blender so I know it doesn’t blend the spinach quite as good as Blendtec or Vitamix. Any thoughts on why our leftovers taste not nearly as good? I’m afraid the ones in the freezer will taste the same and I’ll have to throw them all away. On day 2. Just made this smoothie, added 2 tsps of Flax seed, amazing! Cheers. Hi, I received the menue for 100 days of real food and I am excited to try this. In the meal plan it says “popcorn”, but the recipe does not list it. Do I use it or not. Hi Robin. I’m not sure specifically what you mean but here is Lisa’s popcorn trick: https://www.100daysofrealfood.com/2011/06/17/recipe-the-popcorn-trick/. Could you use frozen spinach? Yes, frozen spinach works, too. Hello, would these work if poured into reusable freezie pop molds and frozen? How do you send smoothies to school? Do you just put them in a thermos? Hi Jenny. Yes, that is the easiest way. Can you put smoothie ingredients in freezer bags and freeze? Will it effect the fresh spinach? My fresh spinach always spoils before I use it all up.